Dragons have long been known for being the fierce protectors of Earth and guardians of mankind. They are the keepers of precious treasure and wisdom. Dragons are often feared for their great strength and honored for their awe-inspiring majesty and powerful magick. To me, dragons are wonderful elusive beings having achieved the perfect balance of both light and dark, yin and yang. 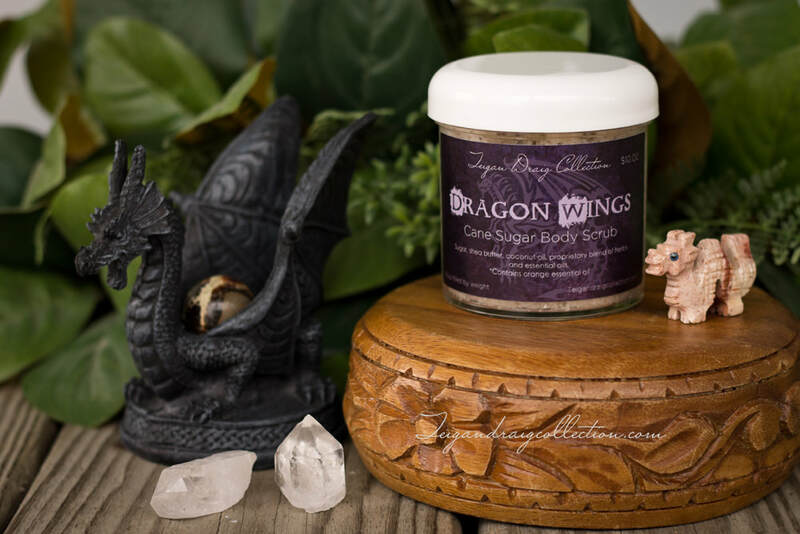 With all this in mind, I am excited to present to you my Dragon Wings line of body scrubs and sea salt bath soaks. Each is made with a proprietary blend of herbs and essential oils for powerful protection, prosperity, love, warmth, boldness, and wisdom. Dragon Wings is great for men too! Sugar body scrub is made with essential oils, shea butter and coconut oil to luxuriously smooth and moisturize your skin without leaving it oily while gently exfoliating. The scent is spicy and warm with hints of sweet orange, licorice, clove, and mint. 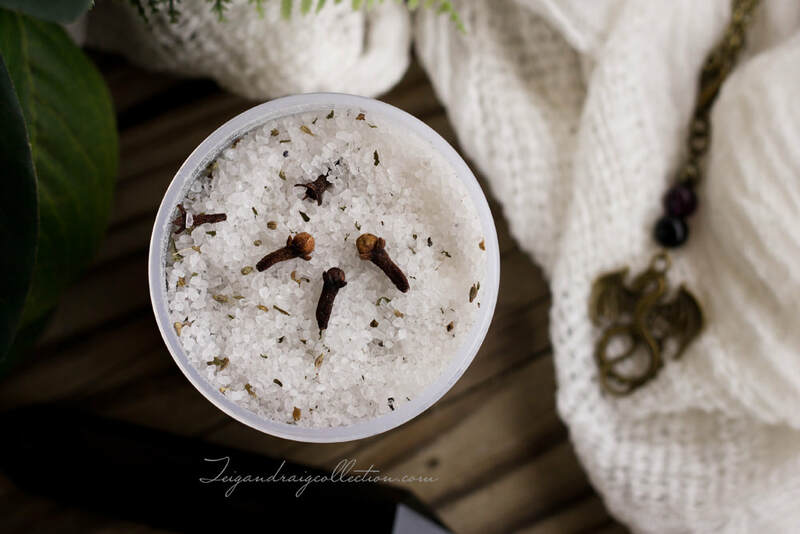 Bath salt soak is made with sea salt and essential oils to detoxify the body, cleanse the aura, and rejuvenate tired or achy muscles. The scent is spicy and warm with hints of clove, licorice, cinnamon, and mint. Dragon Wings Conjure Oil available here . *Note for those with allergies: Dragon Wings Sugar Scrub contains orange essential oil and almond oil (skin emollient). 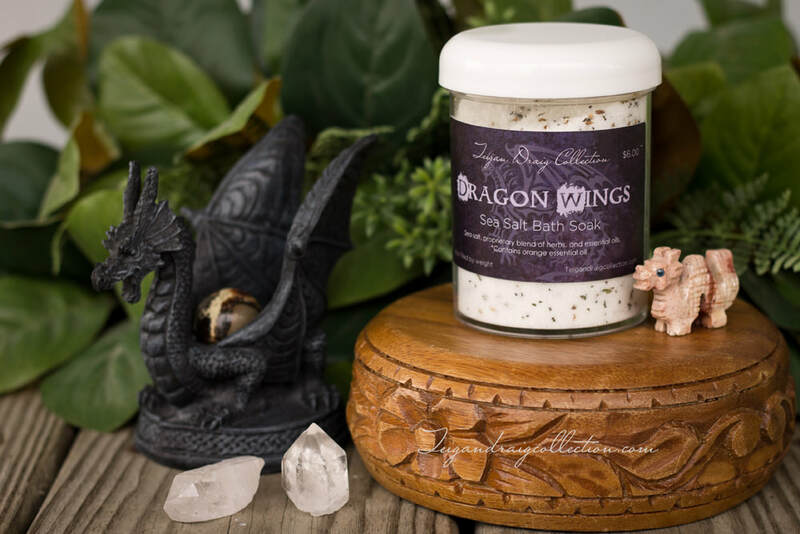 Dragon Wings Sea Salt Soak contains almond oil. If you have an allergy and need a product without almond oil, please contact me. I would be happy to make a custom order for you and substitute a different emollient at no additional cost to you.